Join the PICPA Northeastern Chapter, the Carbon County Community Foundation, and the Carbon Chamber & Economic Development for a two-hour CPE presentation on the Tax Cuts and Jobs Act. In addition, leading experts will speak about tax reform and the Work Opportunity Tax Credit. Registration includes drinks and light fare. Ronald Ulitchney, Tax Partner, Kronick, Kalada Berdy & Co., P.C. Jason C. Williams, Tax Partner, Kronick, Kalada Berdy & Co., P.C. Topics covered will be the timeline to tax reform, individual tax impact, and pass-through entities. The session will conclude with a Q&A. Russ will speak about what is WOTC and who can benefit as well as the industries most impacted. He will also discuss which employee groups are targeted and the before and after: the processs of screening and filing "then" and "now" with new technology. Finally, he will also field questions. 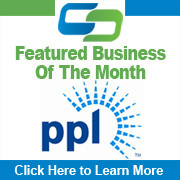 This course qualifies for 1 CLE credit for an additional $25. 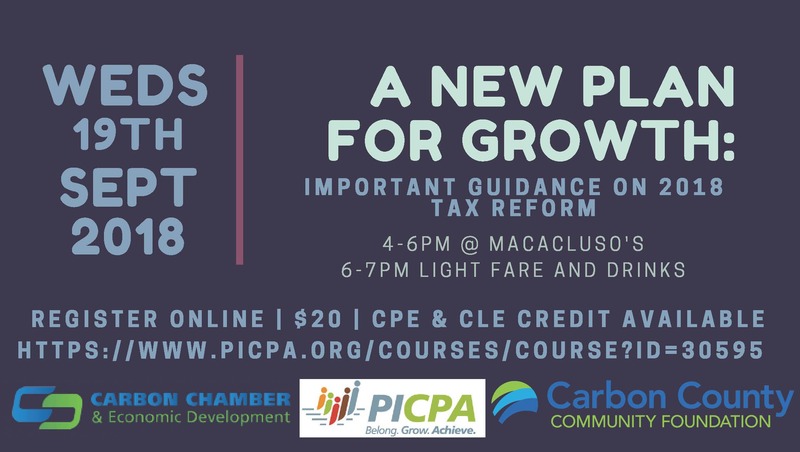 “A New Plan for Growth: Important Guidance on 2018 Tax Reform” will be held Wednesday, September 19, 4:00-7:00pm at Macaluso's Restaurant and Cocktail Bar, Nesquehoning. The CPE/CLE presentation will take place from 4-6:00pm, light fare and drinks to follow from 6-7:00pm. This event is sponsored by the Carbon County Community Foundation, the Carbon Chamber and Economic Development Corporation, and the Pennsylvania Institute of Certified Public Accountants (PICPA). Business owners and professional advisors alike will gain insight into the effects of the 2018 federal tax reforms and prepare to adapt to the changes. The highlight of the event is a presentation on “Planning for Tax Reform,” given by speakers Ronald Ulitchney and Jason C. Williams, both Tax Partners of Kronick, Kalada, Berdy & Co., P.C. in Wilkes Barre. Topics covered will be the timeline to tax reform, individual tax impact, and pass-through entities. The session will conclude with a Q&A. Russ Mehnert, Co-Owner and VP Sales at Diversified Payroll Solutions, will also speak on the Federal & State Tax Credits – Work Opportunity Tax Credit (WOTC). Russ, a resident of Jim Thorpe, will speak about who can benefit from the WOTC, highlighting the industries most impacted. He will provide a first-hand look at logistics for those businesses looking to take advantage of the credit and will also field questions.